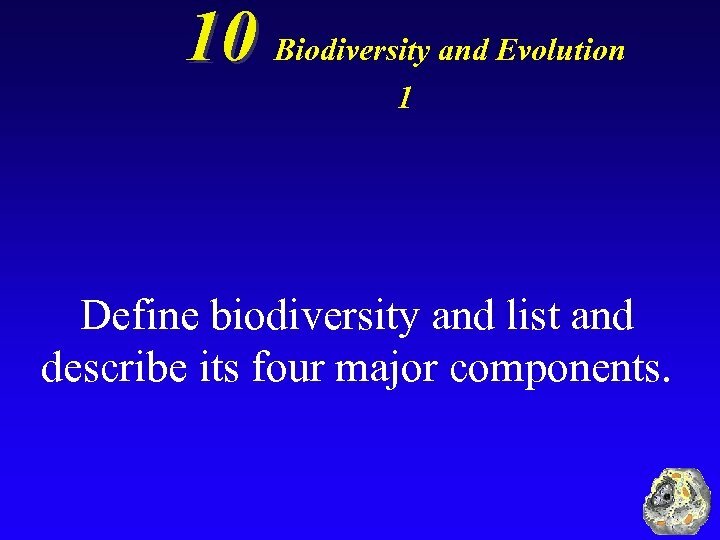 10 Biodiversity and Evolution 1 Define biodiversity and list and describe its four major components. 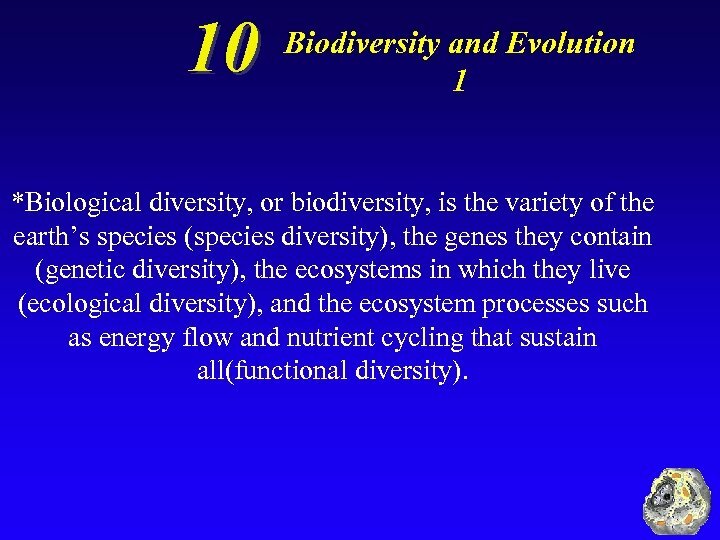 10 Biodiversity and Evolution 1 *Biological diversity, or biodiversity, is the variety of the earth’s species (species diversity), the genes they contain (genetic diversity), the ecosystems in which they live (ecological diversity), and the ecosystem processes such as energy flow and nutrient cycling that sustain all(functional diversity). 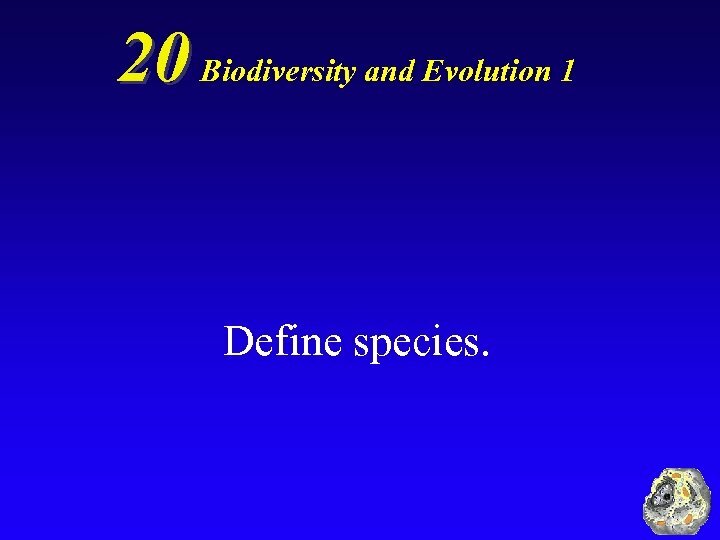 20 Biodiversity and Evolution 1 Define species. 20 Biodiversity and Evolution 1 *A species is a set of individuals that can mate and produce fertile offspring. 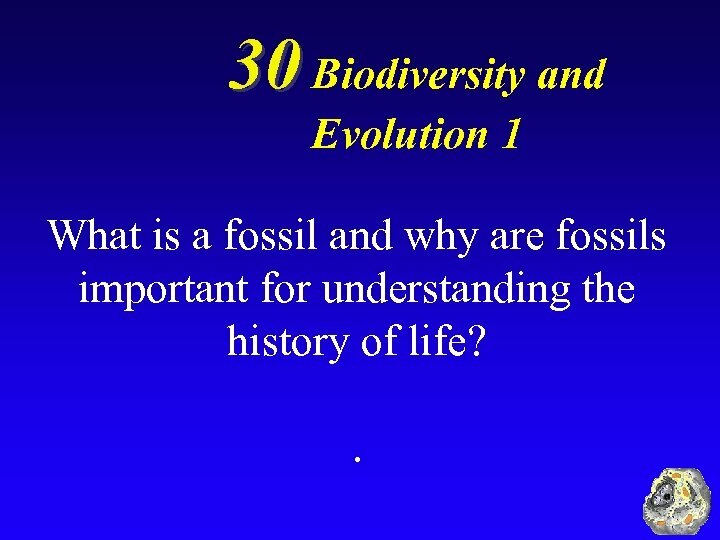 30 Biodiversity and Evolution 1 What is a fossil and why are fossils important for understanding the history of life? . 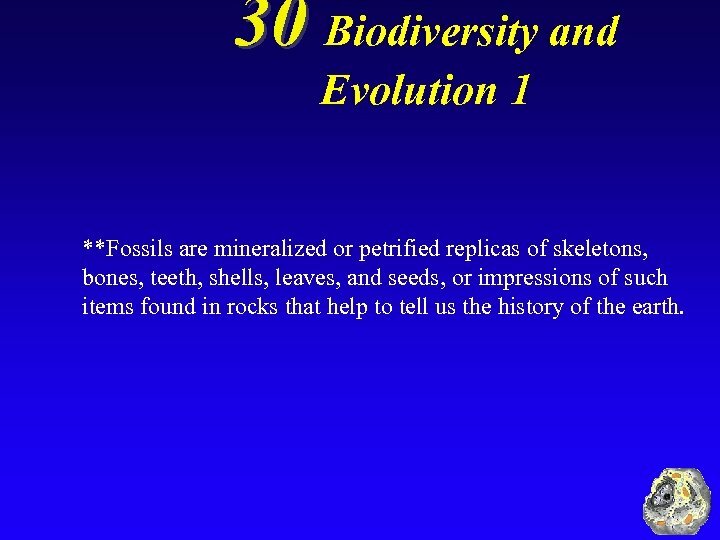 30 Biodiversity and Evolution 1 **Fossils are mineralized or petrified replicas of skeletons, bones, teeth, shells, leaves, and seeds, or impressions of such items found in rocks that help to tell us the history of the earth. 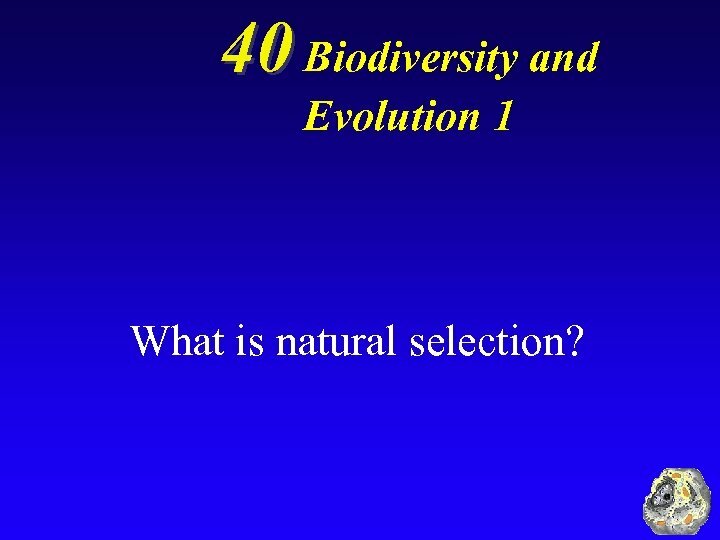 40 Biodiversity and Evolution 1 What is natural selection? 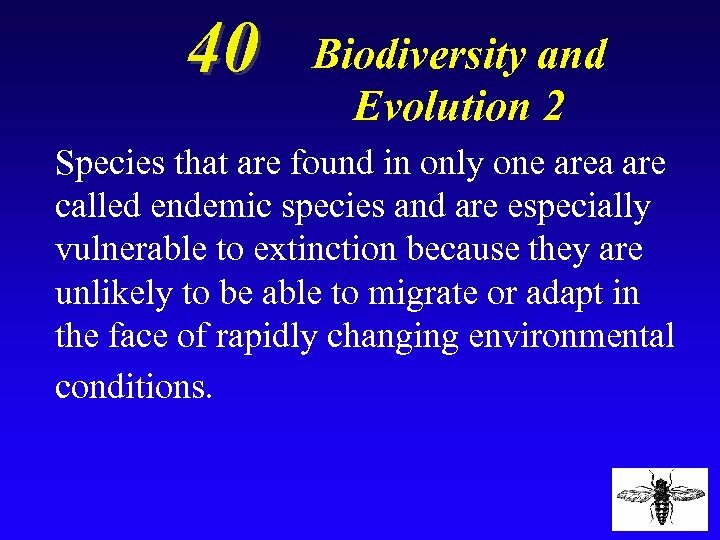 40 Biodiversity and Evolution 1 *Natural selection is the process in which individuals with certain traits are more likely to survive and reproduce under a particular set of environmental conditions than those without the traits. 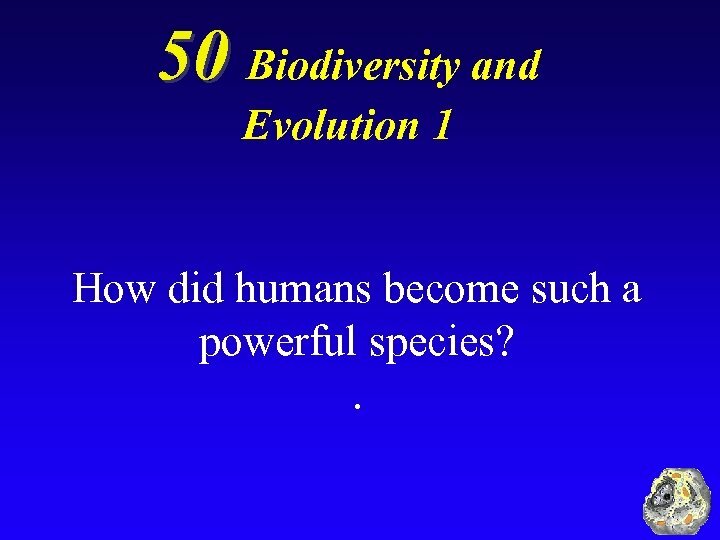 50 Biodiversity and Evolution 1 How did humans become such a powerful species? . 50 Biodiversity and Evolution 1 *Human success is attributed to three adaptations: (1)strong opposable thumbs that allow us to grip and use tools better than the few other animals that have thumbs (2) an ability to walk upright, which gives us agility and frees up our hands for many uses (3) a complex brain, which has allowed us to develop many skills, including the ability to use speech to transmit complex ideas. 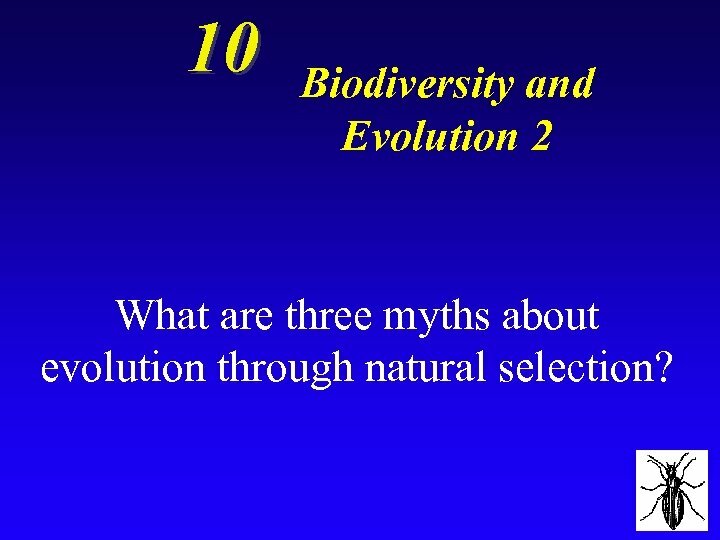 10 Biodiversity and Evolution 2 What are three myths about evolution through natural selection? 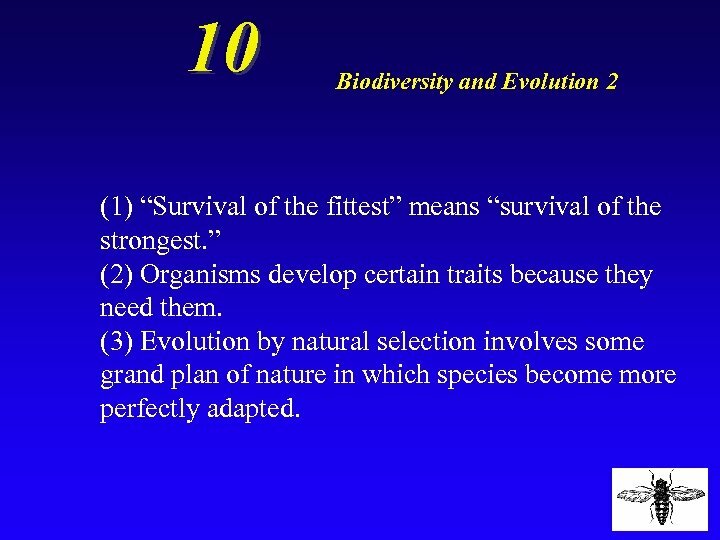 10 Biodiversity and Evolution 2 (1) “Survival of the fittest” means “survival of the strongest. 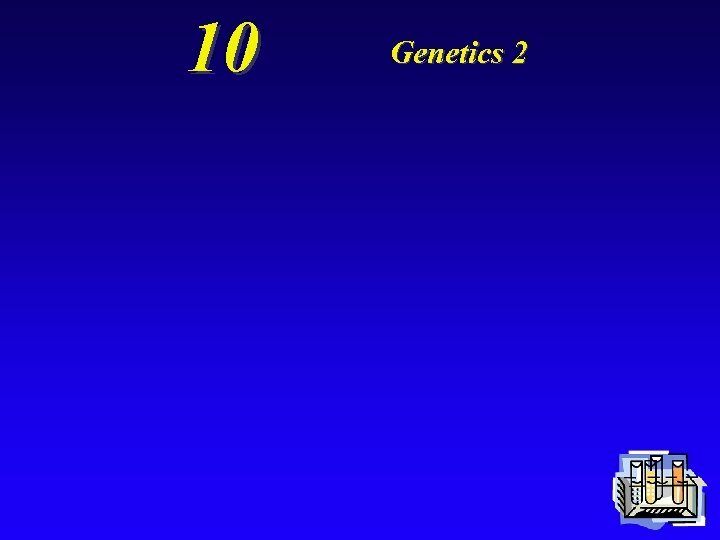 ” (2) Organisms develop certain traits because they need them. 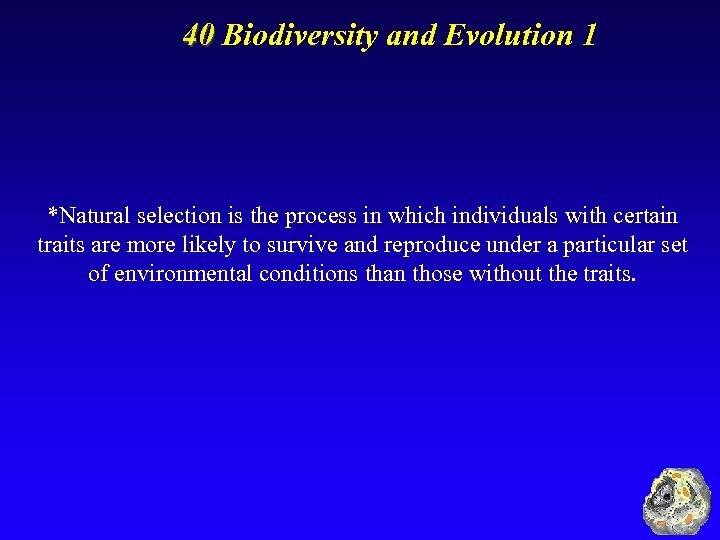 (3) Evolution by natural selection involves some grand plan of nature in which species become more perfectly adapted. 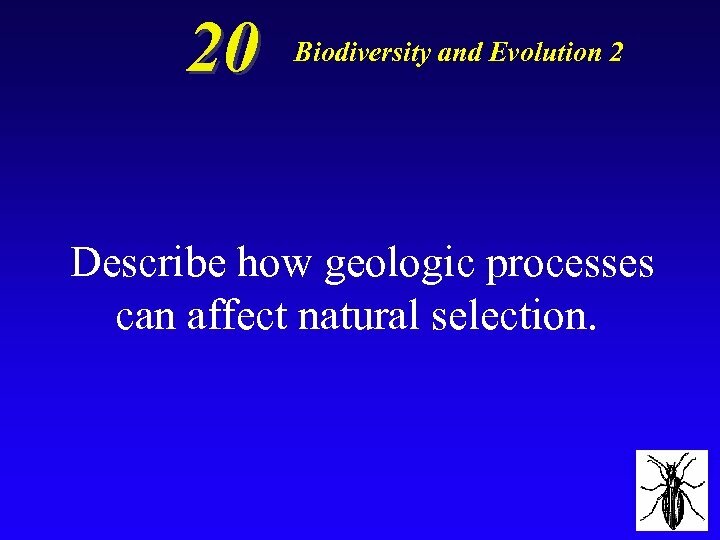 20 Biodiversity and Evolution 2 Describe how geologic processes can affect natural selection. 20 Biodiversity and Evolution 2 *Tectonic plate movements, volcanic eruptions and earthquakes have shifted wildlife habitats, wiped out large numbers of species, and created opportunities for the evolution of new species. 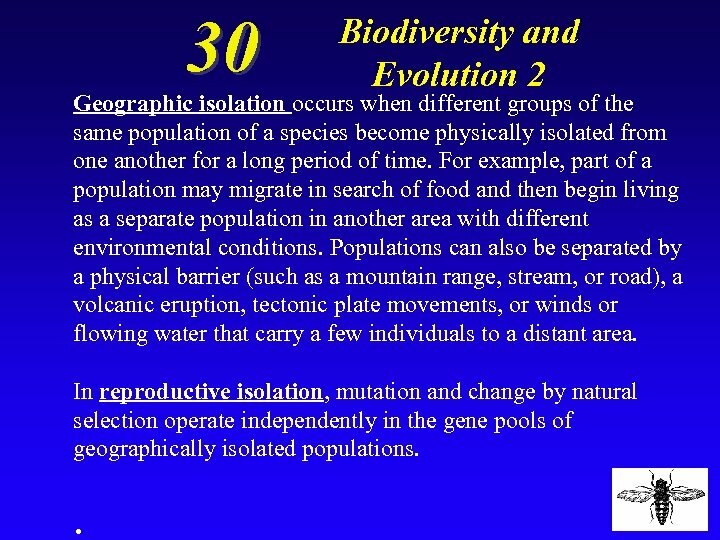 30 Biodiversity and Evolution 2 Distinguish between geographic isolation and reproductive isolation and explain how they can lead to the formation of a new species. 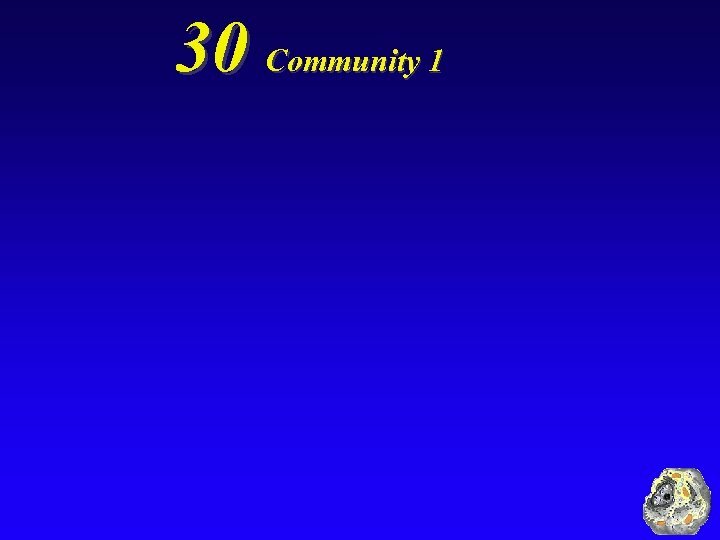 30 Biodiversity and Evolution 2 Geographic isolation occurs when different groups of the same population of a species become physically isolated from one another for a long period of time. 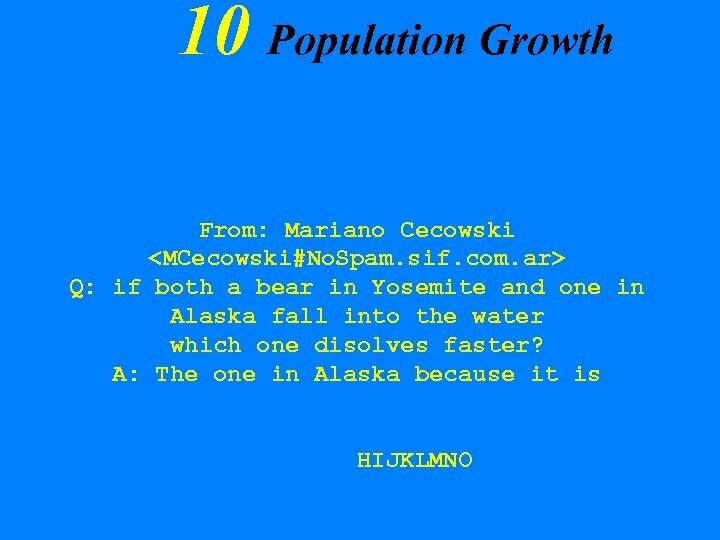 For example, part of a population may migrate in search of food and then begin living as a separate population in another area with different environmental conditions. 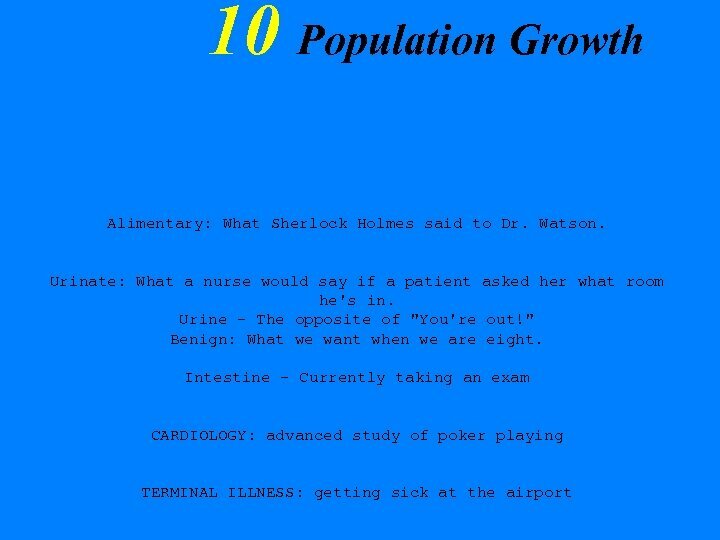 Populations can also be separated by a physical barrier (such as a mountain range, stream, or road), a volcanic eruption, tectonic plate movements, or winds or flowing water that carry a few individuals to a distant area. In reproductive isolation, mutation and change by natural selection operate independently in the gene pools of geographically isolated populations. .
40 Biodiversity and Evolution 2 * What is an endemic species and why can such a species be vulnerable to extinction? 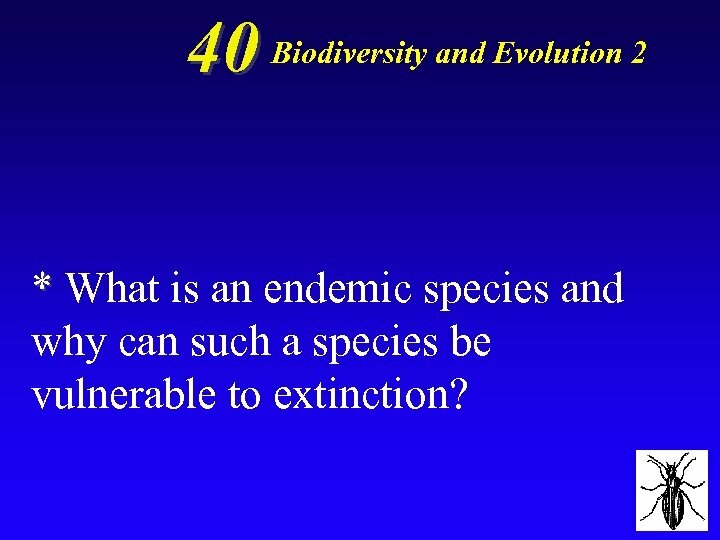 40 Biodiversity and Evolution 2 Species that are found in only one area are called endemic species and are especially vulnerable to extinction because they are unlikely to be able to migrate or adapt in the face of rapidly changing environmental conditions. 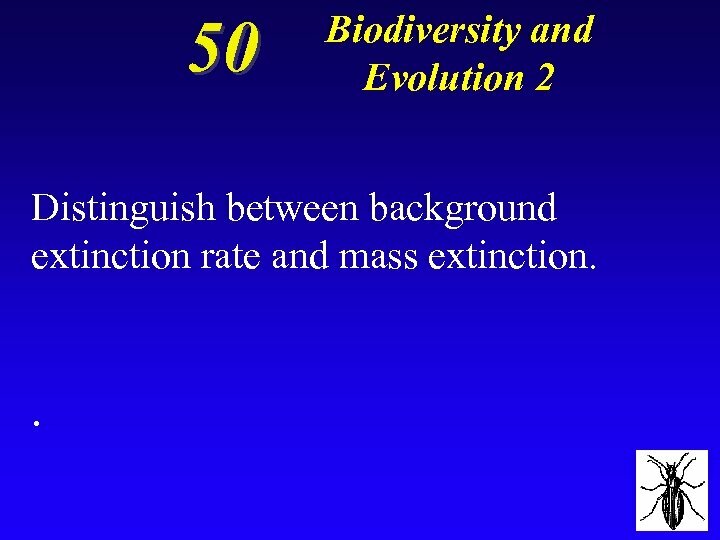 50 Biodiversity and Evolution 2 Distinguish between background extinction rate and mass extinction. .
50 Biodiversity and Evolution 2 ** Throughout most of the earth’s long history, species have disappeared at a low rate, called background extinction. 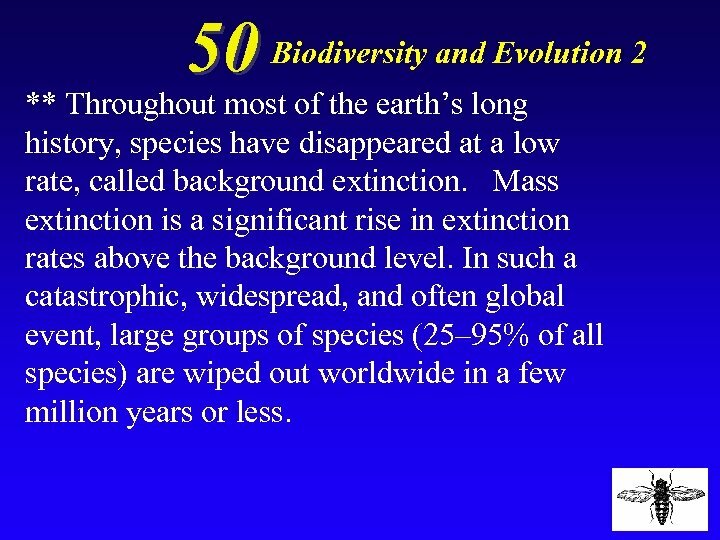 Mass extinction is a significant rise in extinction rates above the background level. In such a catastrophic, widespread, and often global event, large groups of species (25– 95% of all species) are wiped out worldwide in a few million years or less. 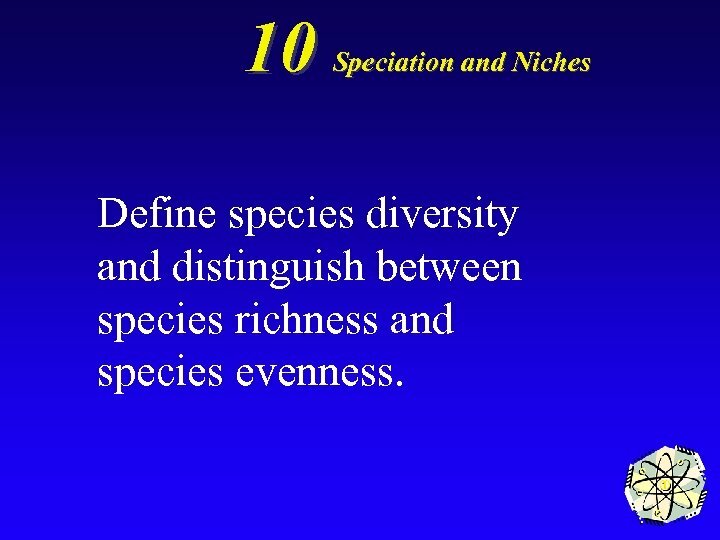 10 Speciation and Niches Define species diversity and distinguish between species richness and species evenness. 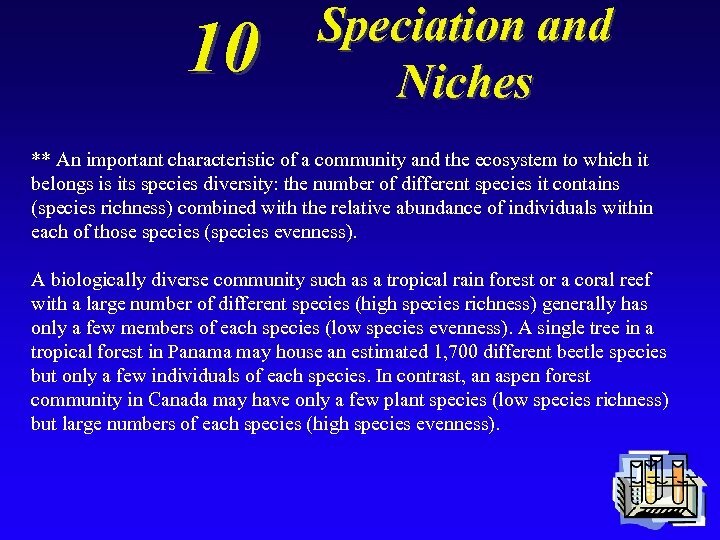 10 Speciation and Niches ** An important characteristic of a community and the ecosystem to which it belongs is its species diversity: the number of different species it contains (species richness) combined with the relative abundance of individuals within each of those species (species evenness). A biologically diverse community such as a tropical rain forest or a coral reef with a large number of different species (high species richness) generally has only a few members of each species (low species evenness). A single tree in a tropical forest in Panama may house an estimated 1, 700 different beetle species but only a few individuals of each species. In contrast, an aspen forest community in Canada may have only a few plant species (low species richness) but large numbers of each species (high species evenness). 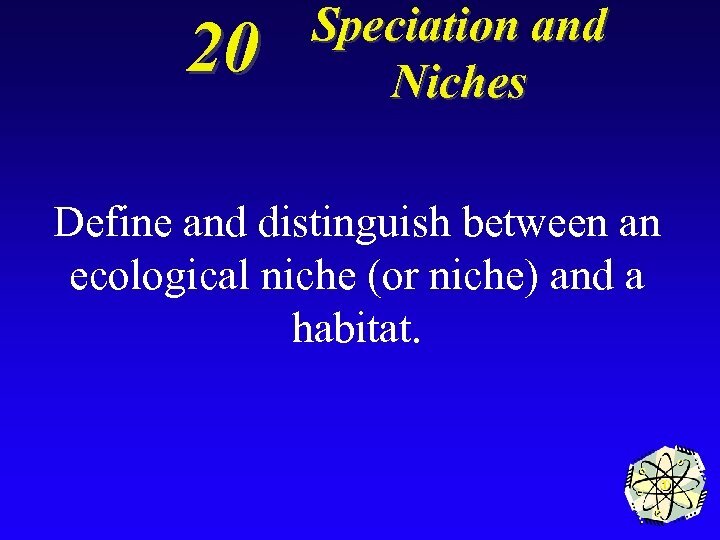 20 Speciation and Niches Define and distinguish between an ecological niche (or niche) and a habitat. 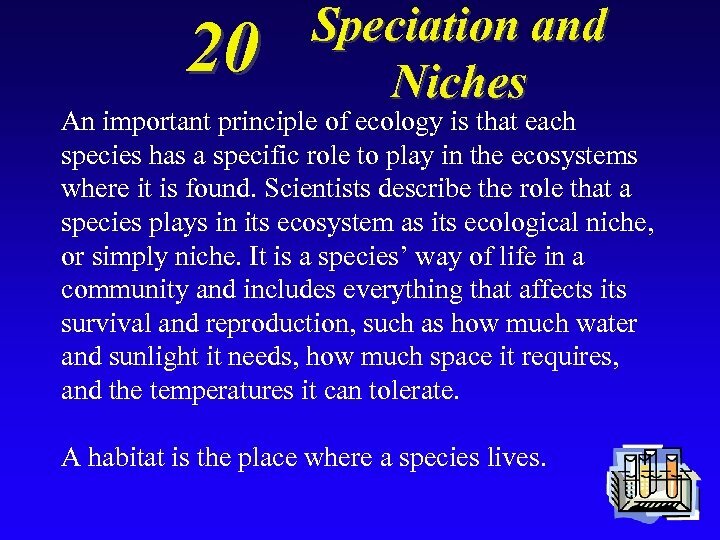 20 Speciation and Niches An important principle of ecology is that each species has a specific role to play in the ecosystems where it is found. Scientists describe the role that a species plays in its ecosystem as its ecological niche, or simply niche. It is a species’ way of life in a community and includes everything that affects its survival and reproduction, such as how much water and sunlight it needs, how much space it requires, and the temperatures it can tolerate. A habitat is the place where a species lives. 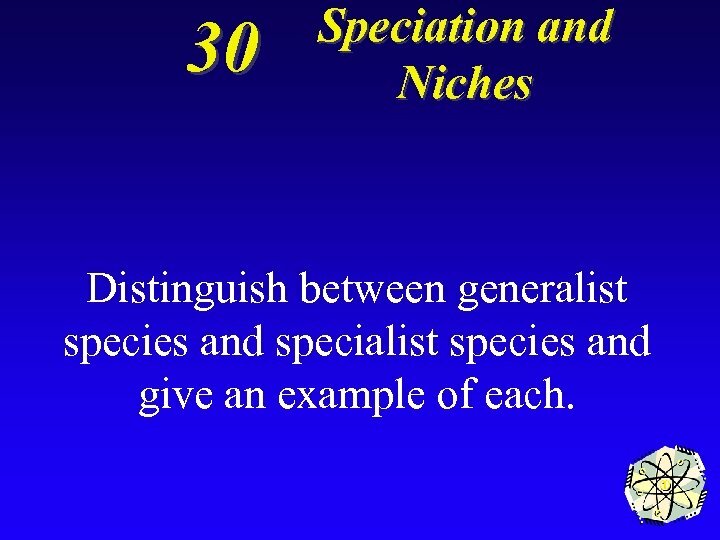 30 Speciation and Niches Distinguish between generalist species and specialist species and give an example of each. 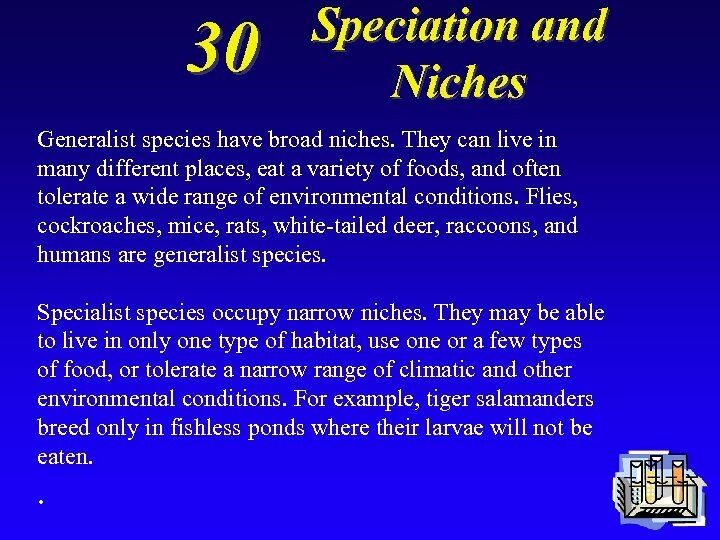 30 Speciation and Niches Generalist species have broad niches. They can live in many different places, eat a variety of foods, and often tolerate a wide range of environmental conditions. Flies, cockroaches, mice, rats, white-tailed deer, raccoons, and humans are generalist species. Specialist species occupy narrow niches. They may be able to live in only one type of habitat, use one or a few types of food, or tolerate a narrow range of climatic and other environmental conditions. For example, tiger salamanders breed only in fishless ponds where their larvae will not be eaten. .
40 Speciation and Niches Why has the fact that the giant panda is a specialist species led to its classification as an endangered species? 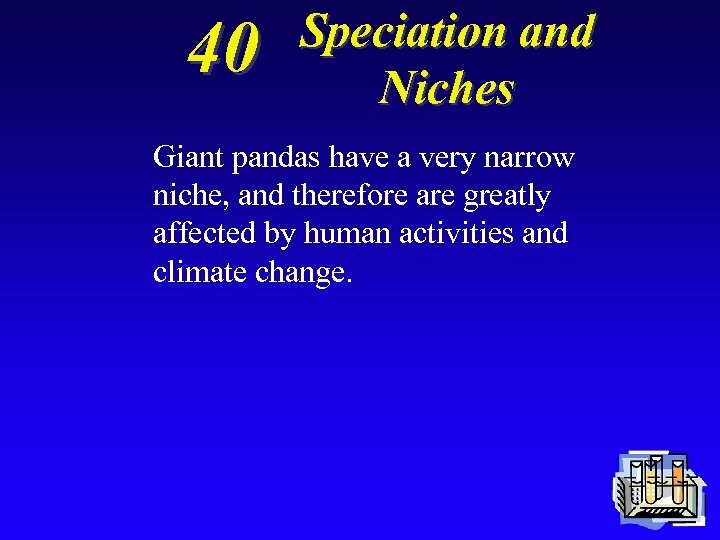 40 Speciation and Niches Giant pandas have a very narrow niche, and therefore are greatly affected by human activities and climate change. 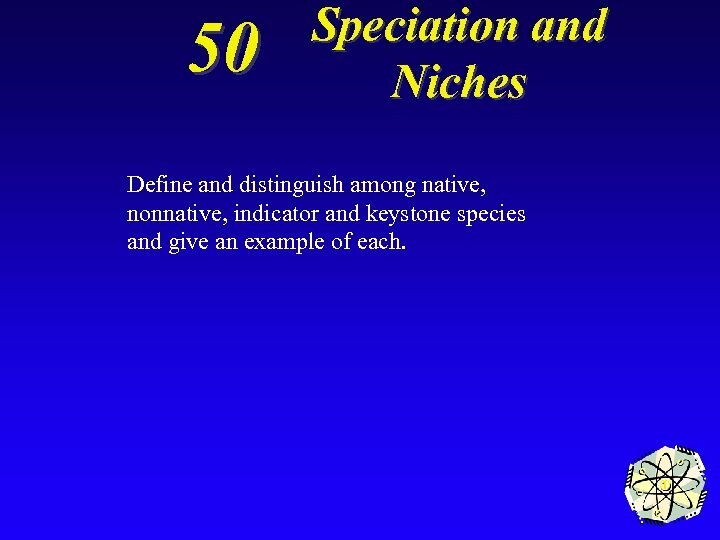 50 Speciation and Niches Define and distinguish among native, nonnative, indicator and keystone species and give an example of each. 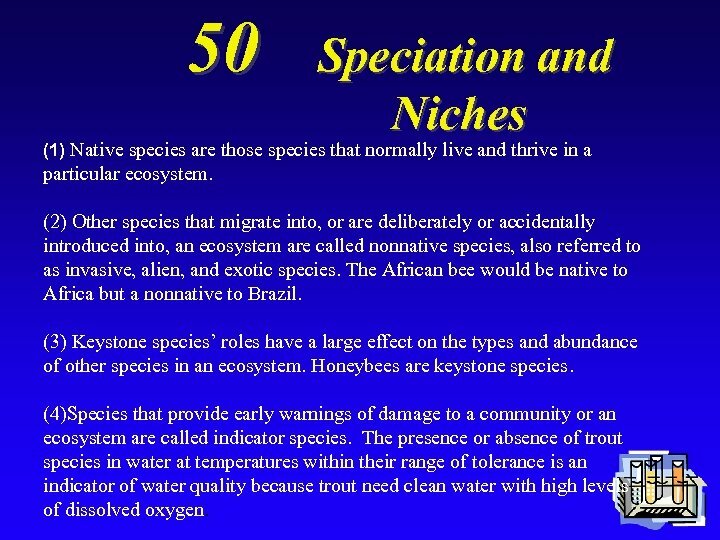 50 Speciation and Niches (1) Native species are those species that normally live and thrive in a particular ecosystem. (2) Other species that migrate into, or are deliberately or accidentally introduced into, an ecosystem are called nonnative species, also referred to as invasive, alien, and exotic species. The African bee would be native to Africa but a nonnative to Brazil. (3) Keystone species’ roles have a large effect on the types and abundance of other species in an ecosystem. Honeybees are keystone species. (4)Species that provide early warnings of damage to a community or an ecosystem are called indicator species. The presence or absence of trout species in water at temperatures within their range of tolerance is an indicator of water quality because trout need clean water with high levels of dissolved oxygen. 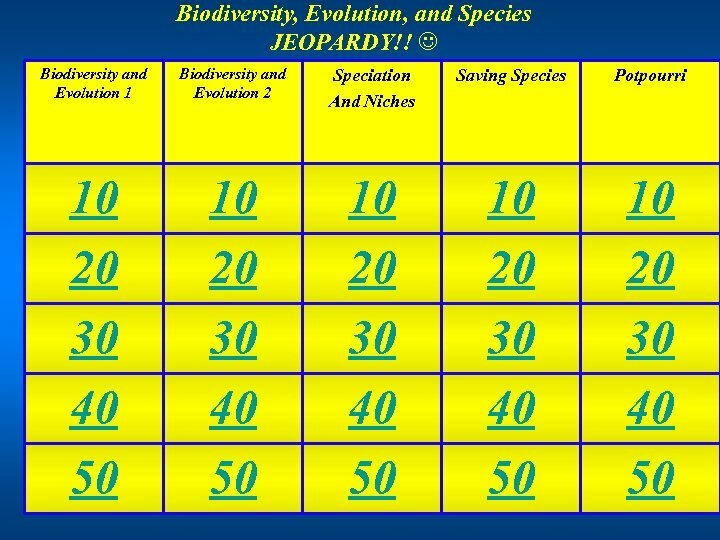 10 Saving Species Distinguish between endangered species and threatened species and give an example of each. 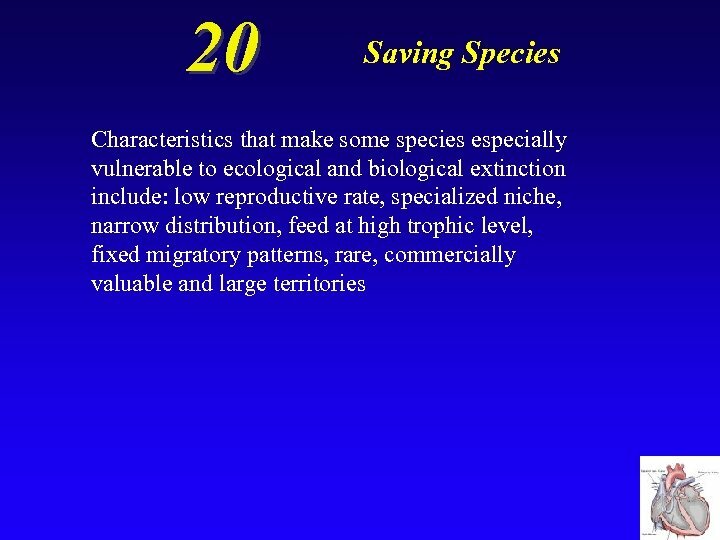 10 Saving Species An endangered species has so few individual survivors that the species could soon become extinct over all or most of its natural range (the area in which it is normally found). 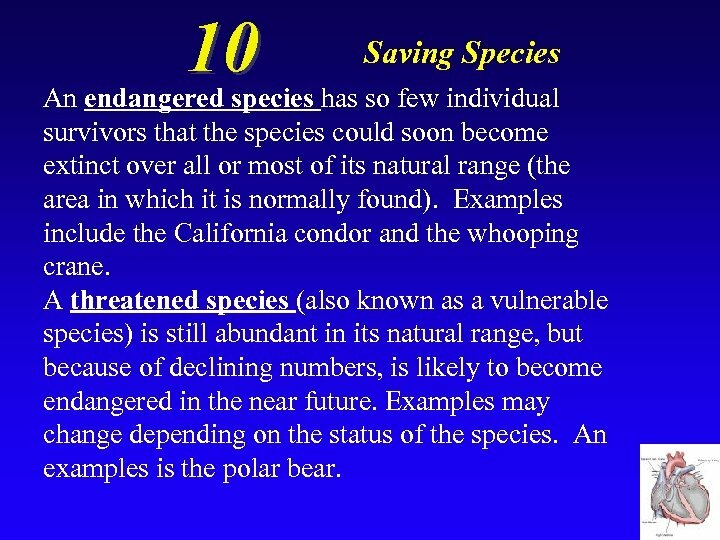 Examples include the California condor and the whooping crane. A threatened species (also known as a vulnerable species) is still abundant in its natural range, but because of declining numbers, is likely to become endangered in the near future. 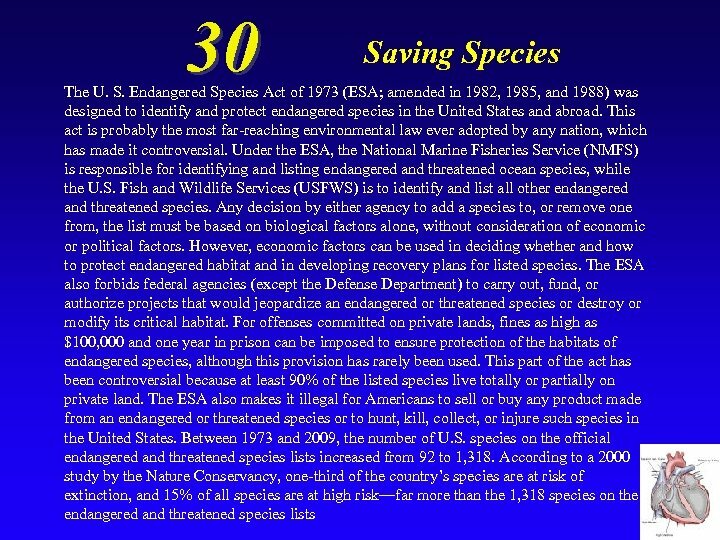 Examples may change depending on the status of the species. An examples is the polar bear. 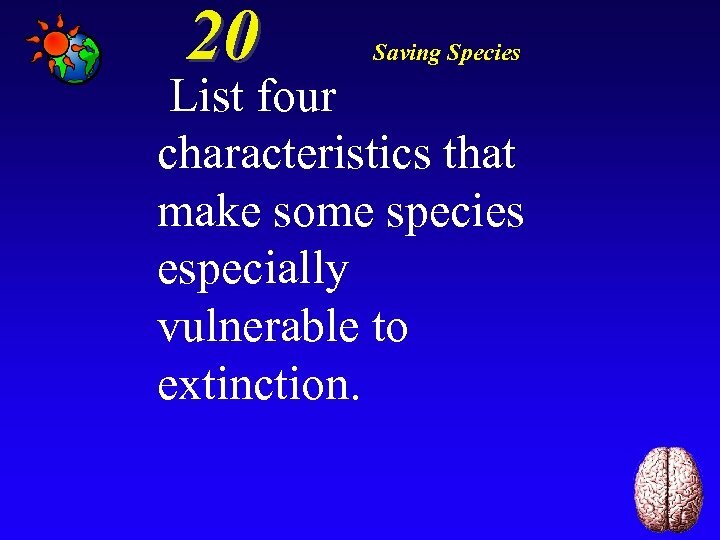 20 Saving Species List four characteristics that make some species especially vulnerable to extinction. 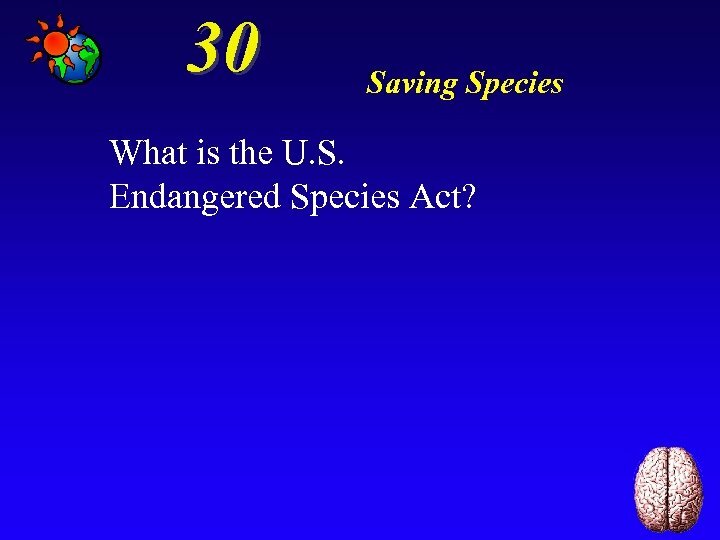 30 Saving Species What is the U. S. Endangered Species Act? 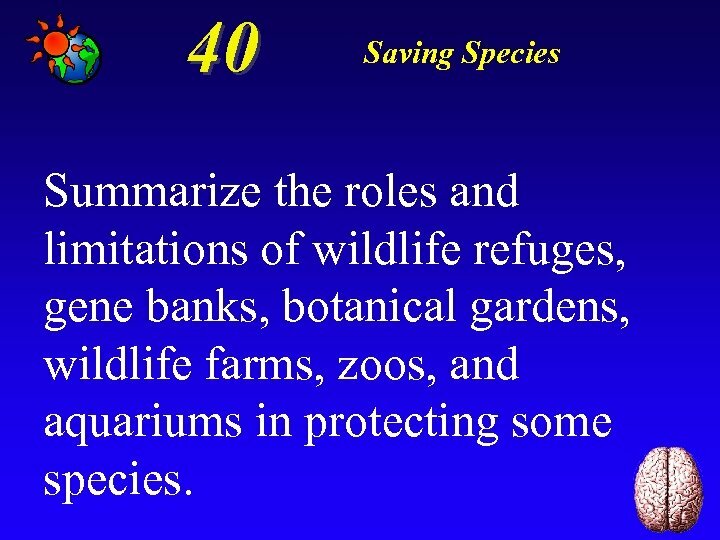 40 Saving Species Summarize the roles and limitations of wildlife refuges, gene banks, botanical gardens, wildlife farms, zoos, and aquariums in protecting some species. 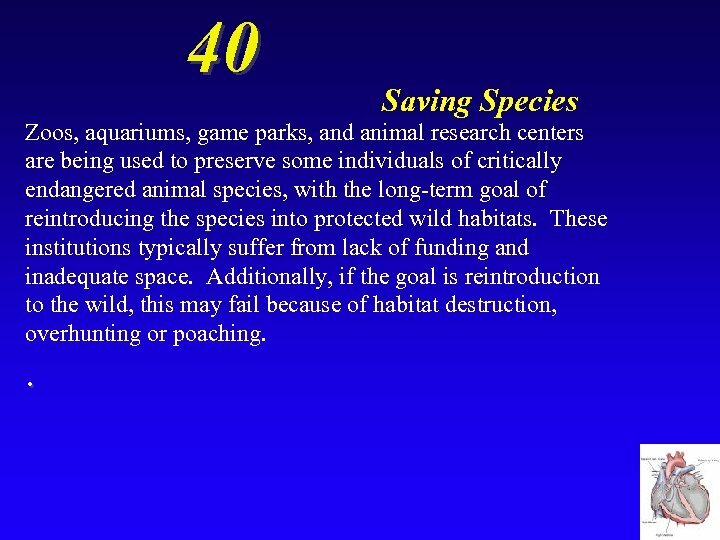 40 Saving Species Zoos, aquariums, game parks, and animal research centers are being used to preserve some individuals of critically endangered animal species, with the long-term goal of reintroducing the species into protected wild habitats. These institutions typically suffer from lack of funding and inadequate space. 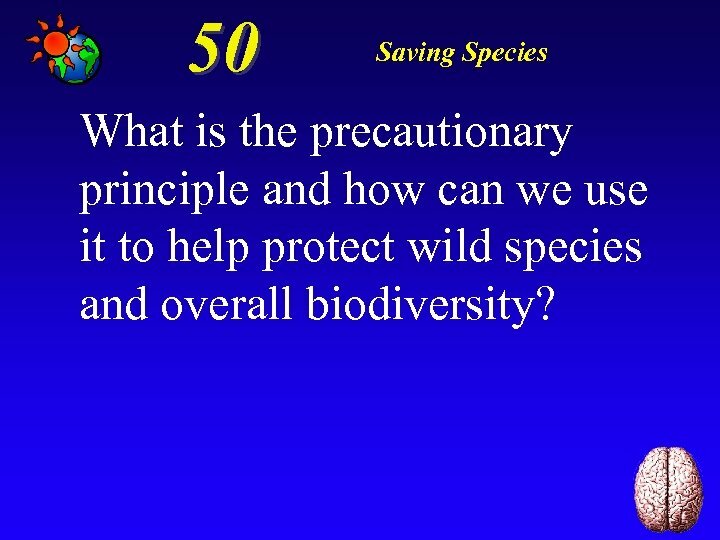 Additionally, if the goal is reintroduction to the wild, this may fail because of habitat destruction, overhunting or poaching. .
50 Saving Species What is the precautionary principle and how can we use it to help protect wild species and overall biodiversity? 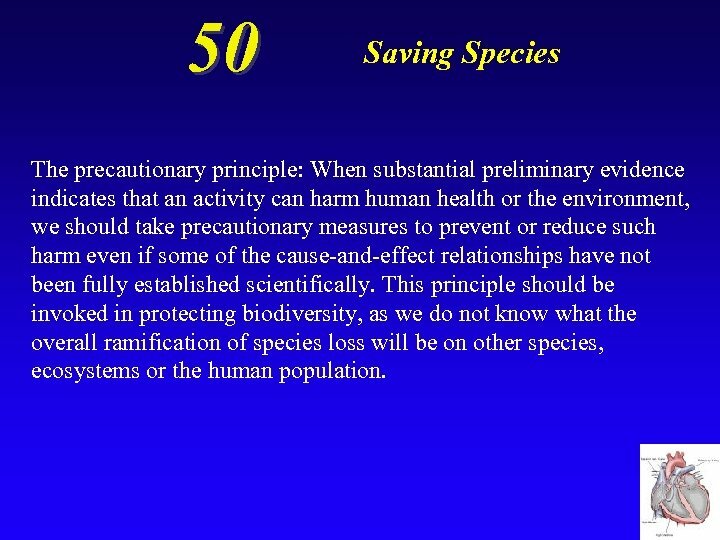 50 Saving Species The precautionary principle: When substantial preliminary evidence indicates that an activity can harm human health or the environment, we should take precautionary measures to prevent or reduce such harm even if some of the cause-and-effect relationships have not been fully established scientifically. 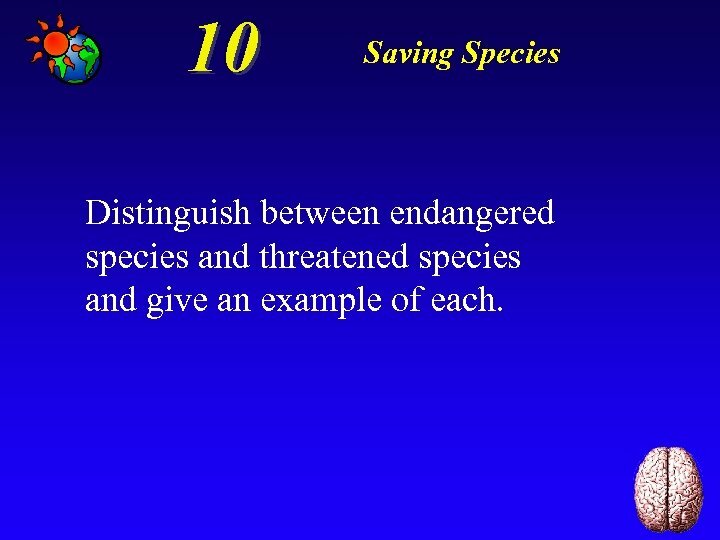 This principle should be invoked in protecting biodiversity, as we do not know what the overall ramification of species loss will be on other species, ecosystems or the human population. 10 Genetics 2 My name is Bond, Ionic Bond; Taken, not shared! 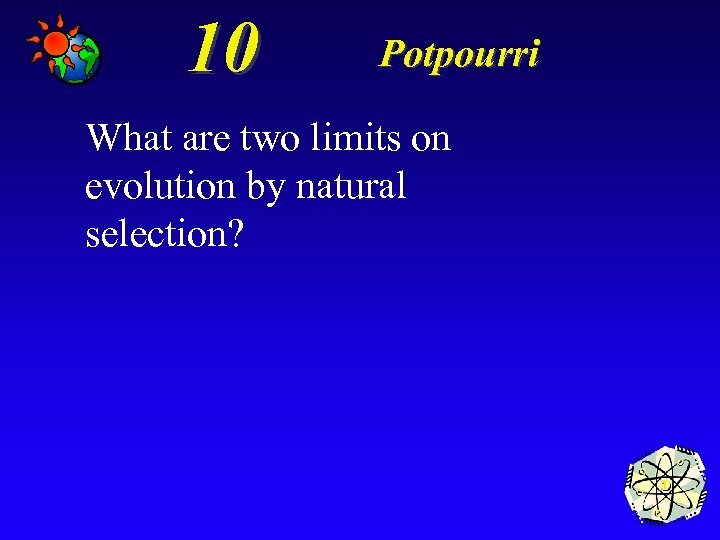 10 Potpourri What are two limits on evolution by natural selection? 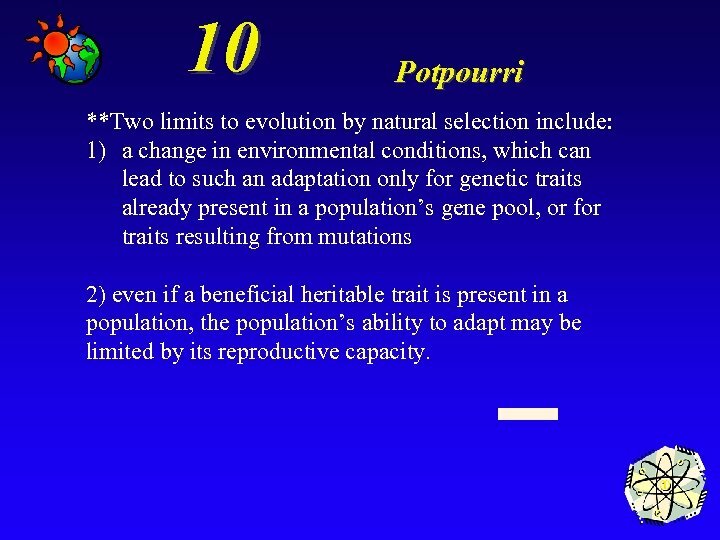 10 Potpourri **Two limits to evolution by natural selection include: 1) a change in environmental conditions, which can lead to such an adaptation only for genetic traits already present in a population’s gene pool, or for traits resulting from mutations 2) even if a beneficial heritable trait is present in a population, the population’s ability to adapt may be limited by its reproductive capacity. 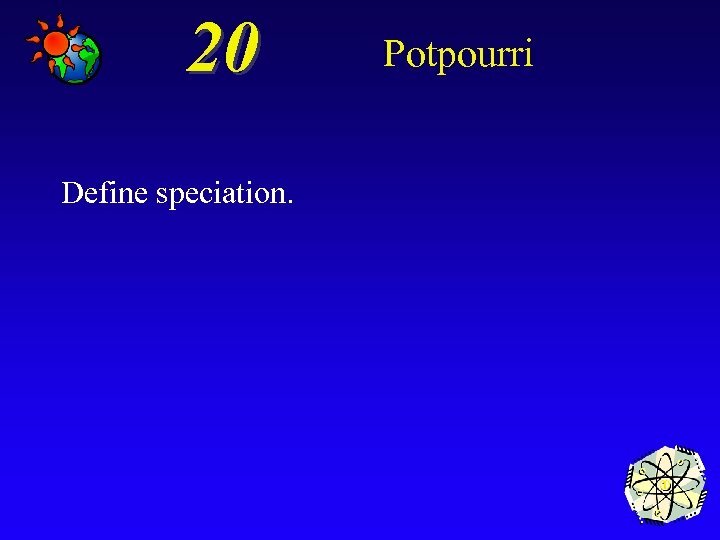 20 Potpourri Speciation is when one species splits into two or more different species. 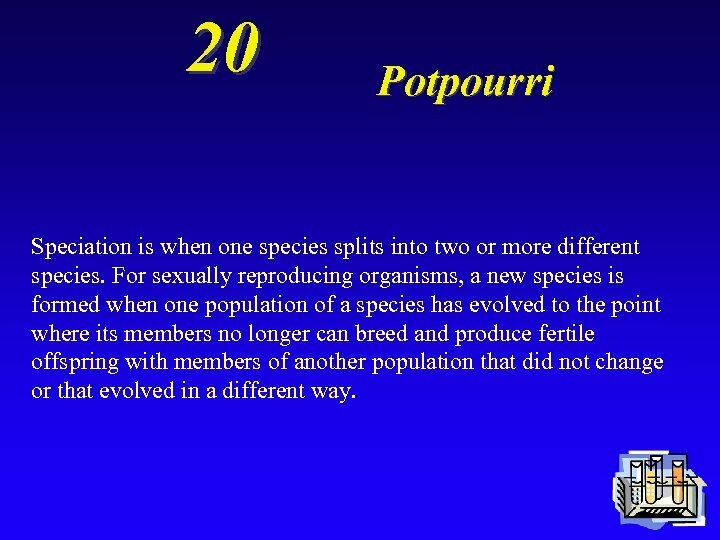 For sexually reproducing organisms, a new species is formed when one population of a species has evolved to the point where its members no longer can breed and produce fertile offspring with members of another population that did not change or that evolved in a different way. 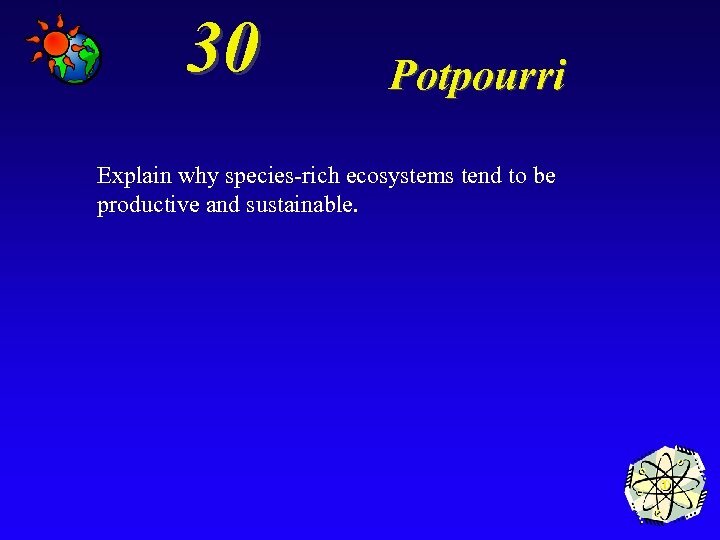 30 Potpourri Explain why species-rich ecosystems tend to be productive and sustainable. 30 Potpourri *Species diversity is a major component of biodiversity and tends to increase the sustainability of some ecosystems. Research suggests that species richness affect an ecosystem because plant productivity is higher in species-rich ecosystems and species richness enhances the stability, or sustainability of an ecosystem. 40 Potpourri Describe two economic and two ecological benefits of species diversity. 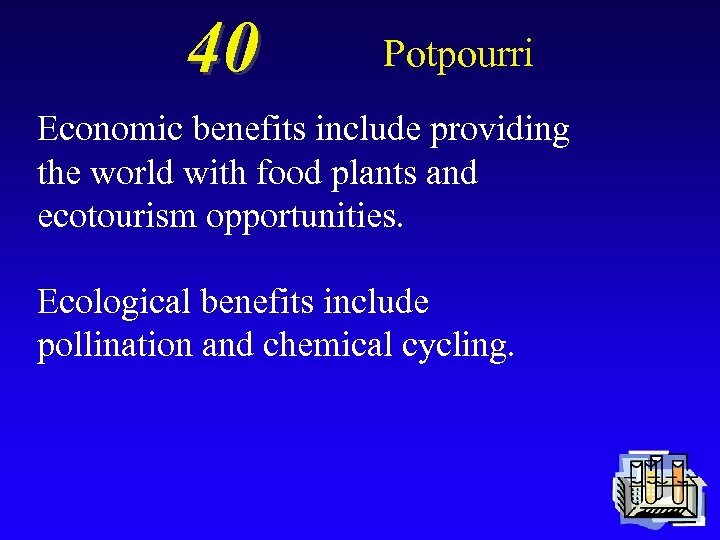 40 Potpourri Economic benefits include providing the world with food plants and ecotourism opportunities. Ecological benefits include pollination and chemical cycling. 50 Potpourri Explain why prevention is the best way to reduce threats from invasive species and list five ways to implement this strategy. 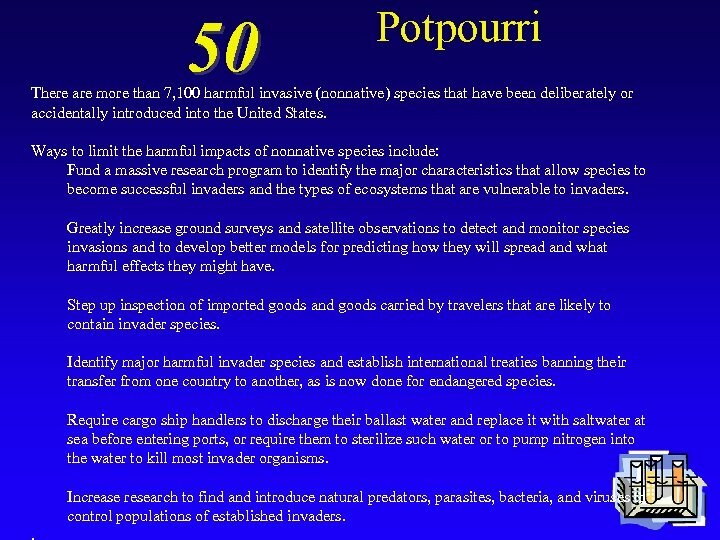 50 Potpourri There are more than 7, 100 harmful invasive (nonnative) species that have been deliberately or accidentally introduced into the United States. Ways to limit the harmful impacts of nonnative species include: Fund a massive research program to identify the major characteristics that allow species to become successful invaders and the types of ecosystems that are vulnerable to invaders. Greatly increase ground surveys and satellite observations to detect and monitor species invasions and to develop better models for predicting how they will spread and what harmful effects they might have. Step up inspection of imported goods and goods carried by travelers that are likely to contain invader species. Identify major harmful invader species and establish international treaties banning their transfer from one country to another, as is now done for endangered species. Require cargo ship handlers to discharge their ballast water and replace it with saltwater at sea before entering ports, or require them to sterilize such water or to pump nitrogen into the water to kill most invader organisms. Increase research to find and introduce natural predators, parasites, bacteria, and viruses to control populations of established invaders.